HIKING® specializes in the production and sale of various types of concrete equipment. Its products have passed ISO 9001 quality system certification and European CE certification. The company's product, very high cost-effective and best-selling in more than 20 countries around the world, enjoys first-class quality and stable performance, and has agents in many countries. The main concrete leveling products include concrete laser screed, concrete power screed, concrete truss screed and concrete roller screed, which are widely used in various concrete leveling projects. HIKING® Concrete Power Screed Machine adopts a lighter body, simple operation and durable aluminium alloy vibrating plate. It can be operated flexibly through the handle on the hand-held vibrating ruler and be suitable for any person with various heights to operate, increasing its usage range and convenience. It can be widely used in various concrete leveling projects. 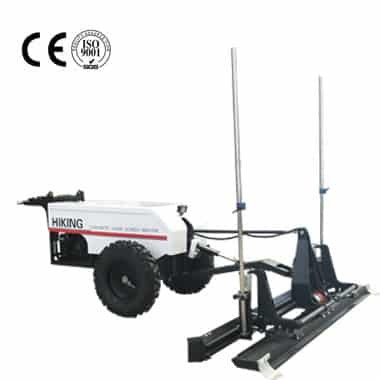 HIKING® Concrete truss screed machine, which uses the original Honda gasoline engine, is widely used in concrete pavement, bridge and ground engineering for concrete ground pulping, compaction and leveling. Its leveling effect is very good. The width of the road surface can be formed once in the range of 4-18 meters, which can reduce the longitudinal construction joints. Because the running track and the template are separated, the leveling work is not affected by the base level, and the pavement level can be ensured and the formed concrete surface has no honeycomb grinding surface, peeling cracks and stone exposed phenomenon, and the quality is easy to guarantee. HIKING® Concrete Laser screed machine is the most advanced concrete leveling equipment in the world, which can be widely used in various kinds of concrete ground leveling projects. The machine is based on the horizontal laser emitted by the laser transmitter, and automatically adjusts the height of the leveling head with high accuracy. There is no need to install a template in the leveling process, which can effectively reduce the input of manpower and improve the leveling efficiency.